I hope you will keep breathing through this crisis and just live with the anxiety for a while. Don't let yourself panic because you don't have a real job lined up. Having the freedom to grow is a rare gift; don't be in a rush to shackle it, especially with something mundane and safe. Jan's words reminded me of a quote a friend recently sent me, attributed to Rear Admiral Grace Murray Hopper (who had an incredible career): "A ship in port is safe, but that's not what ships are built for." I've indeed been hedging about this project and I need to muster the courage to leave sight of the shore (to invoke an other famous quote). I have been through enough in life that safety shouldn't be my primary concern. The challenge is to tolerate the unknown while I figure out what I am "built for." I'm also trying to put safety aside in subtler ways. 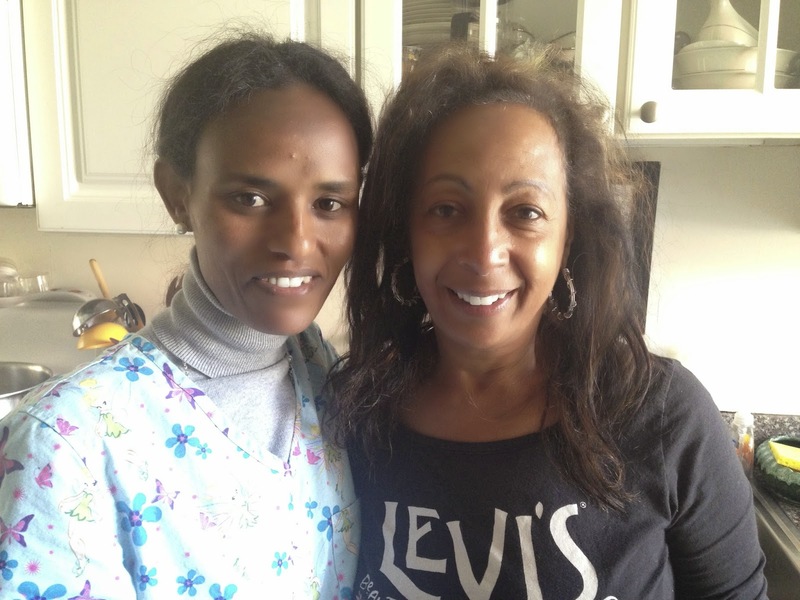 A couple of weeks ago, I was bumbling down a city block near the Panhandle of Golden Gate Park, looking for the apartment of Anemo's former daycare provider, an Ethiopian woman by the name of Bethlehem. I knew the apartment's approximate location, but I didn't want to ring any wrong doorbells. Fearing embarrassment, I left without accomplishing anything. Last Thursday, though, with a feeling that my project could be in jeopardy without tangible progress, I started ringing doorbells, even encountering one woman whose disagreeable temper didn't seem to belong in San Francisco. Nevertheless, the woman did gruffly direct me to the right apartment, where Bethlehem answered the door, pausing a full 15 seconds before recognizing me. It was a terrific reunion after that, and we shared what's happened in our lives since Anemo last spent time there in the fall of 2009. (Her estranged husband passed away and her 20-year-old son recently had a baby.) Bethlehem had a new assistant from Eritrea named Senait (Sunny for short). I explained to Bethlehem my project to learn Amharic, and she agreed to help. In fact, she started right away introducing me to important vocabulary and phrases. When she wanted to show me the Amharic script, Bethlehem appealed to Senait for help since she felt rusty. We all collaborated to recall parts of the Amharic alphabet. Senait, who trained as a nurse, speaks Tigrinya and Amharic and very little English, so that will force me to practice my rudimentary language. I hope to have time speaking with her away from the possibility of English translation. 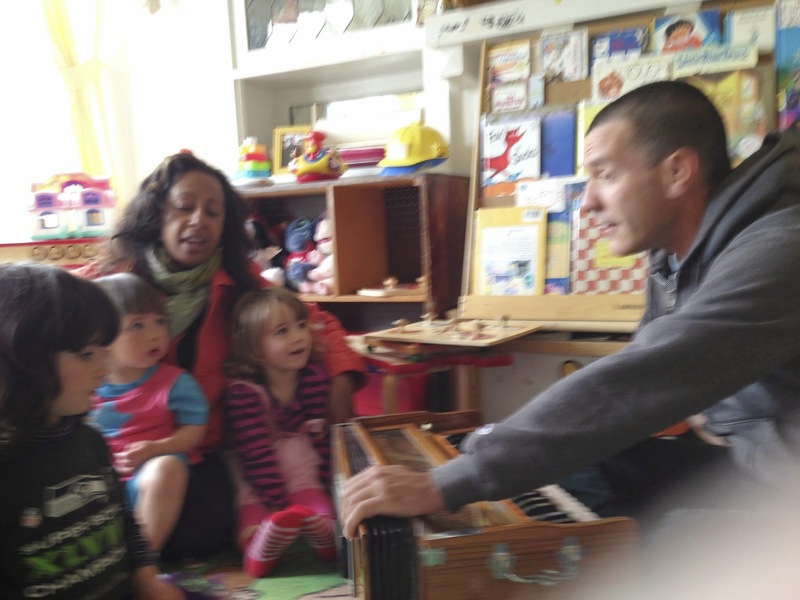 Before I left, I agreed to return to play music for the kids in exchange for more immersion in Amharic. I made good on that promise today, showing up with my harmonium and mandolin ready to entertain. Alganesh ("Algu" for short), a longtime aide, was there instead of Senait, and she remembered Anemo from five years ago. After a few rounds of "Twinkle, Twinkle," "Itsy Bitsy," and some other daycare classics, Alganesh sang a beautiful religious song that I recorded. Bethlehem provided the translation. Old MacDonald had a duck, dog, cat, and cow, in that order. Algu invited me to attend an Ethiopian church service in San Francisco some Sunday morning. (She sings in the church choir.) I look forward to that rich cultural experience. The more connections I make, the more I feel like I'm leaving the port, or the shore, or the safety of a traditional occupation. This afternoon, during our FaceTime meeting (postponed from last week), Jan said that perhaps I will create my own job instead of competing with others for jobs that already exist. It's much too early to tell what will emerge from this project, but for now I have an increasing resolve to find out.